If you’re like me, the creative part of your brain resists throwing anything out. 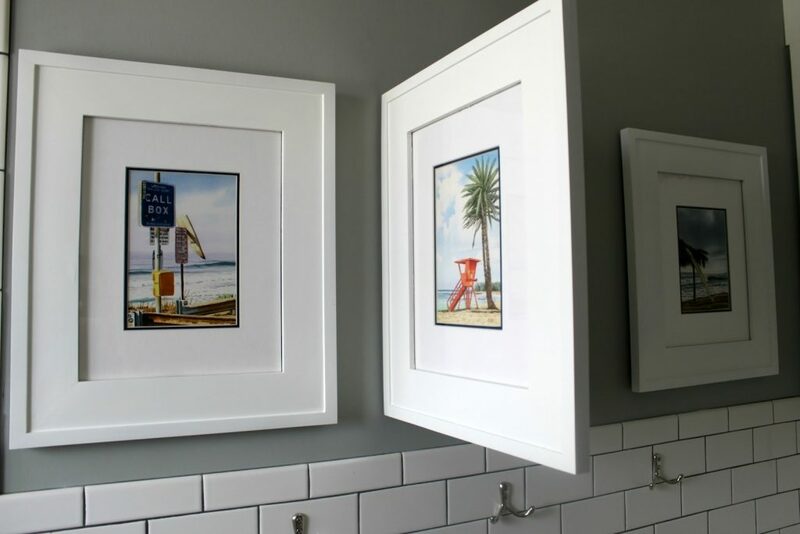 And now you’ve got a handful of picture frames (or maybe you scored a few vintage frames from Goodwill), but you’re in need of some DIY craft ideas. 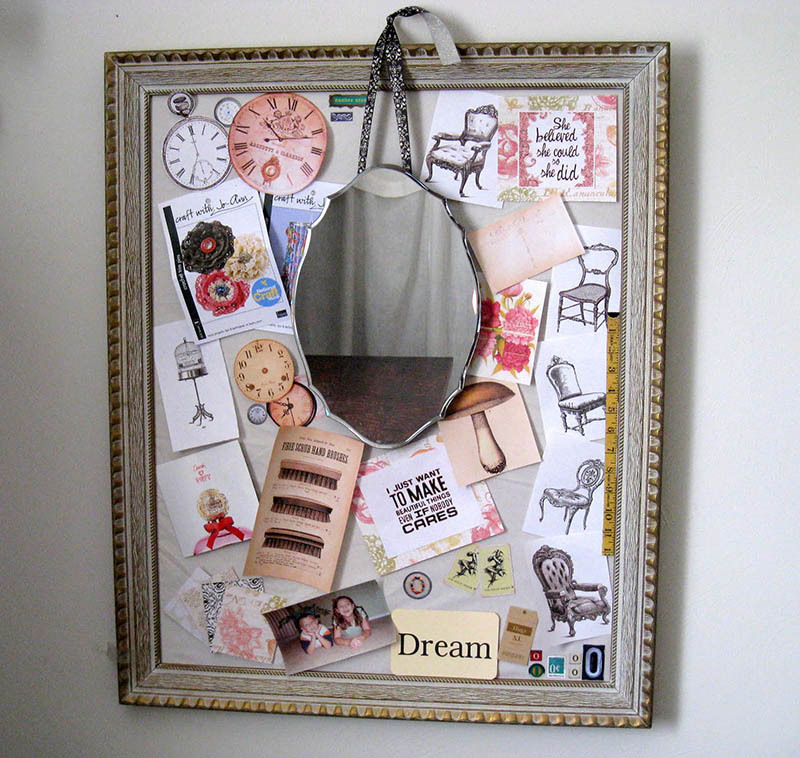 I’m a master at recycling (or “upcycling”) old stuff, and old picture frames are no exception. So I scoured the interwebs for all the coolest ideas and put them here in a nifty list for you. 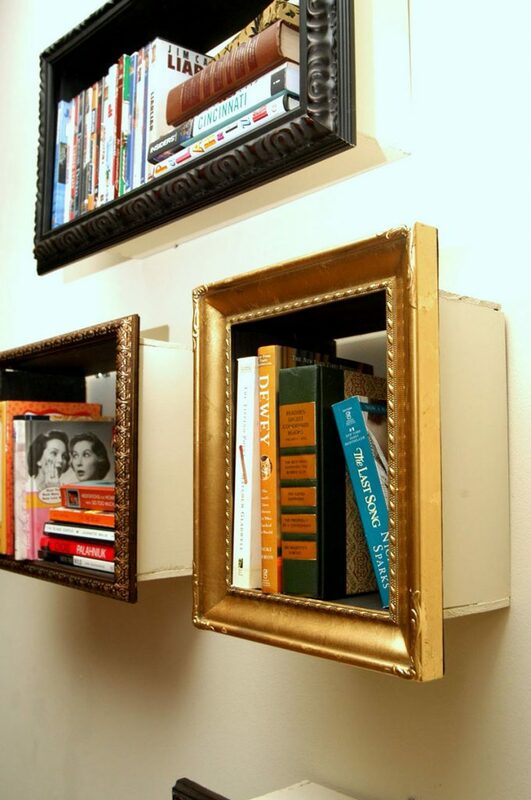 A simple shelf with a little extra elegance, perfect for books or those sentimental items. If you’re like me then you would haphazardly throw all your earrings in a bowl and have to dig through it like lost treasure to find a matching pair. 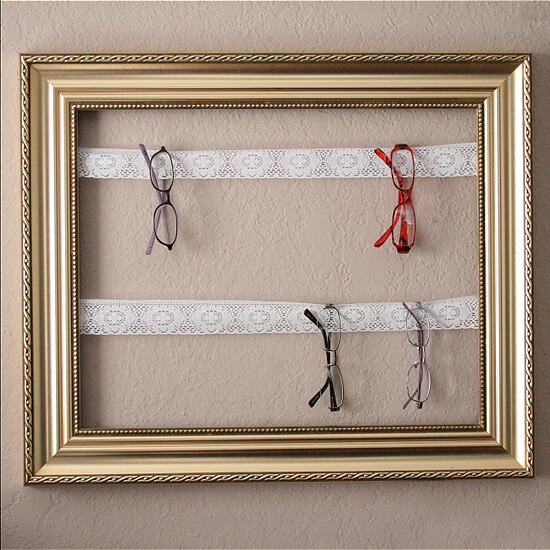 This is a simple and elegant way to put them on display and keeps your life more organized than mine. 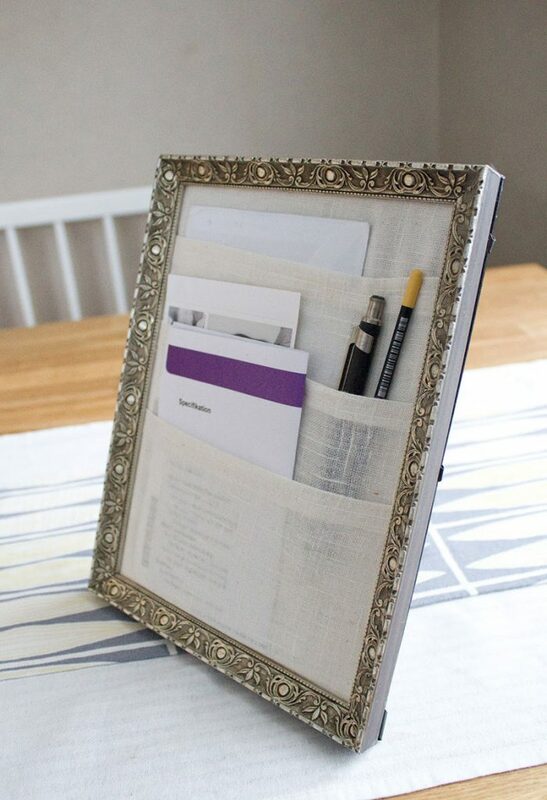 A really unique and wonderful way to keep old notes safe and on display. 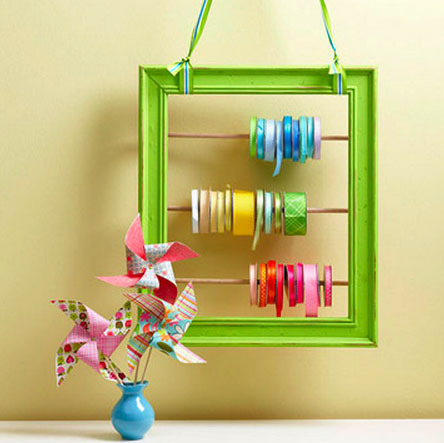 This is just cute and a good little boredom buster, not to mention it goes well with any thrift store frame. 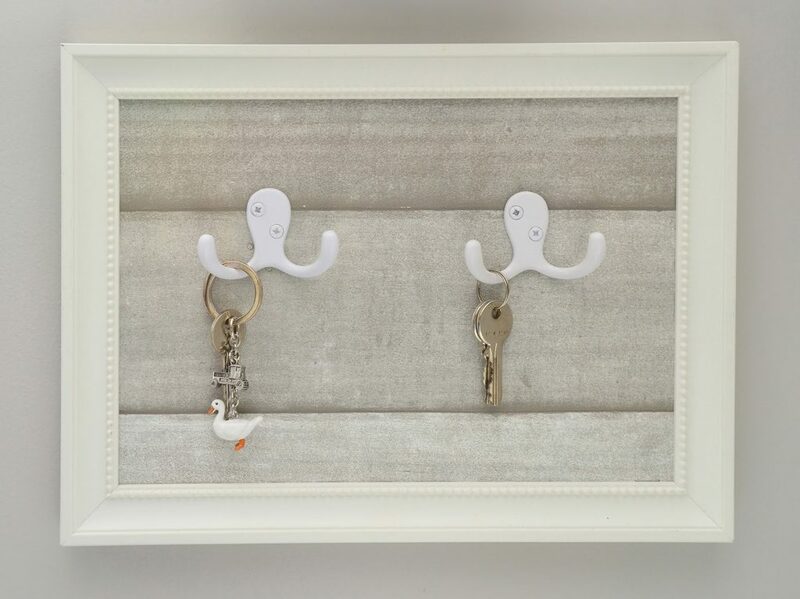 Another jewelry holder, but with a lot more room for organization, and doubles as some unique wall decor. 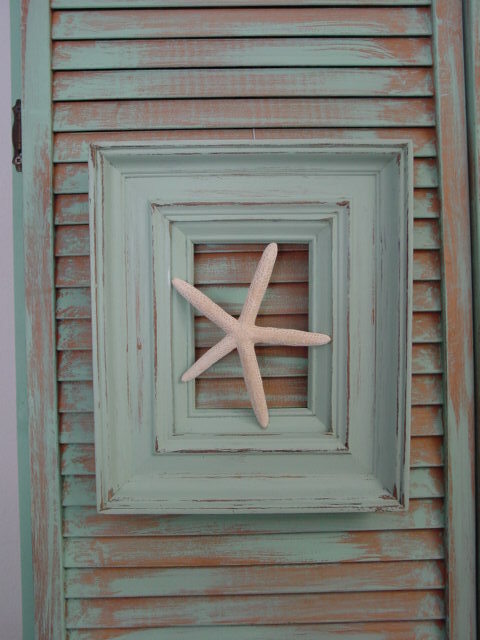 Every house needs one of these, so make it look like part of your home with a simple frame. 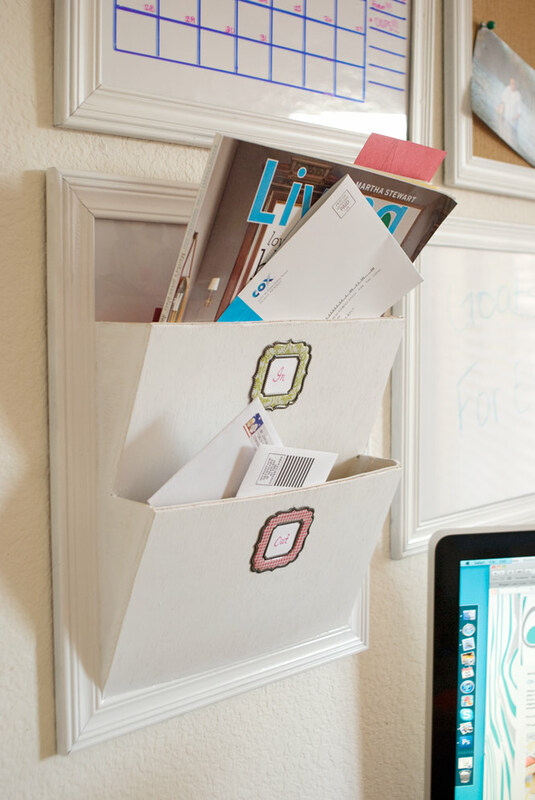 Everyone needs one of these, a simple envelope system to keep your bills, mail, and important notes within arms reach (instead of the pile that develops on the kitchen counter). 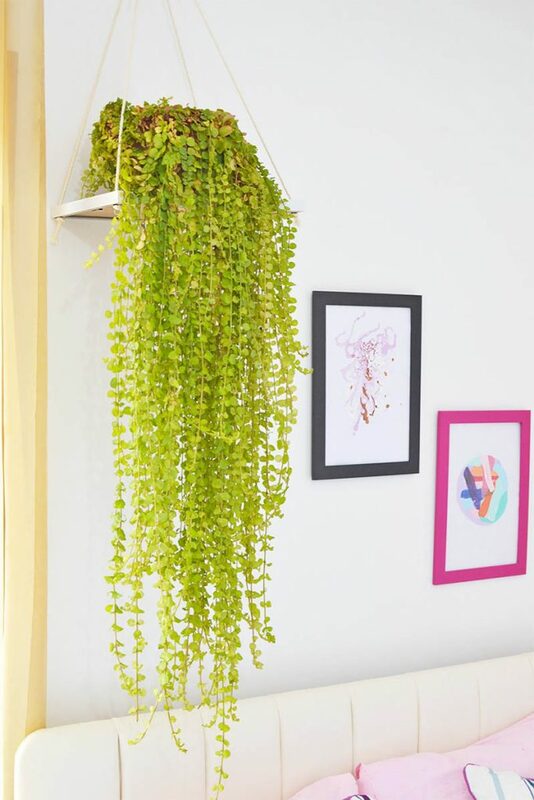 If you’ve got the garden bug and feel the need to plant something, this is a great little project, and perfect if you don’t have a garden but still want somewhere to display your next plant. Got a craft room and dozens of little spools (ribbon or otherwise? ), maybe you need a neat little dispenser. 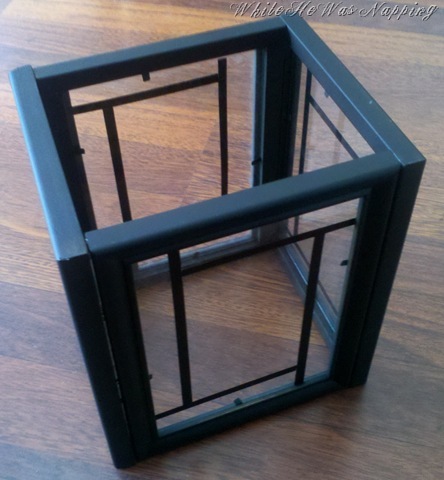 This is some next level thinking, using frames for a terrarium is not something I would have ever thought of, but now that I see this it makes total sense. 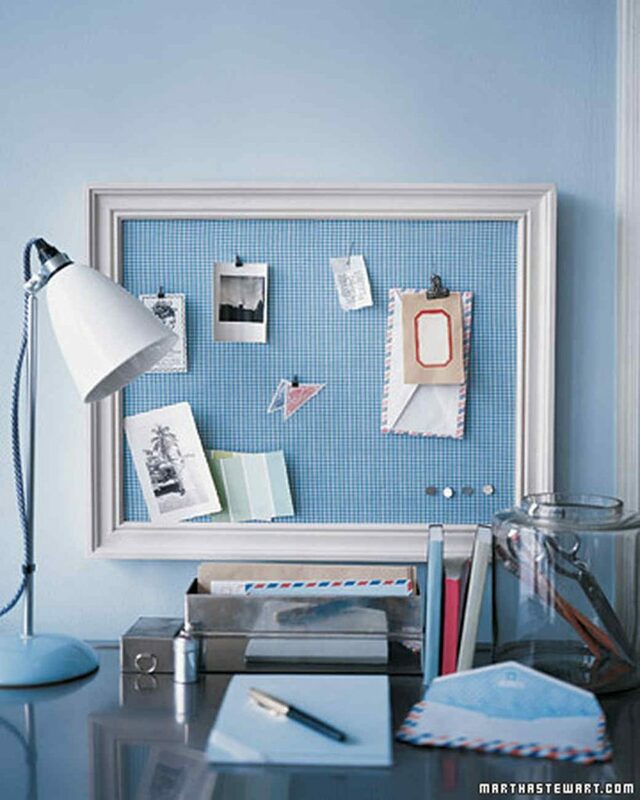 Bulletin boards are so plain and boring, they need to get with the times, and none other than Martha Stewart as the solution. 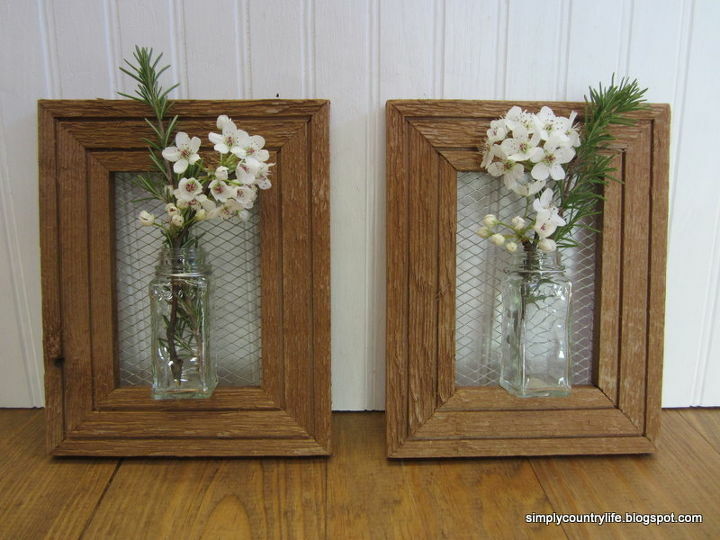 Turning something old into something new while still making it look kinda old, it’s what rustic beauty is all about. 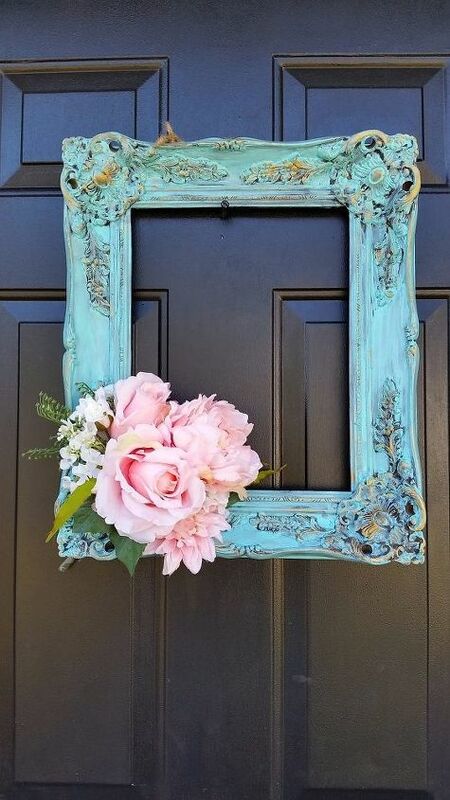 Impress your guests with your rustic charm and using an old frame to create a beautiful tray. Sometimes you don’t even need anything in the frame to display it’s beauty. 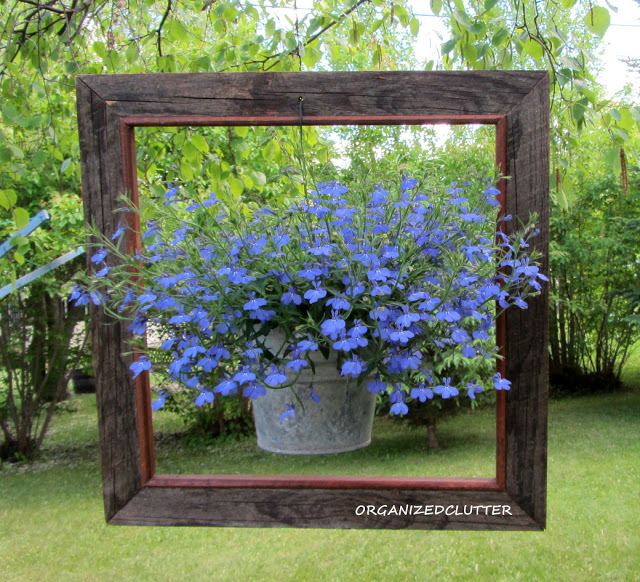 Another framed hanging pot, but instead of a free standing frame now we have something to display to the whole world. 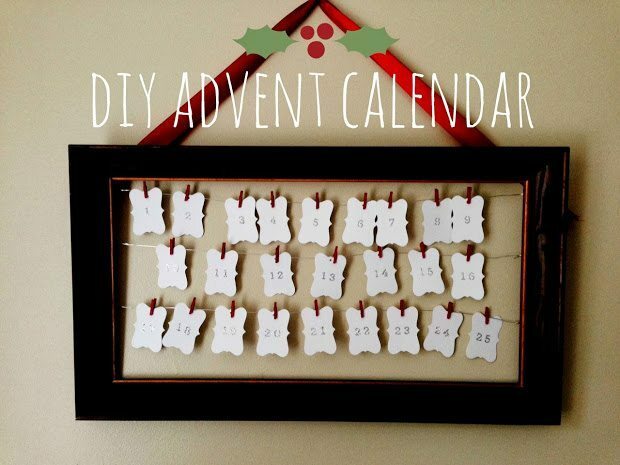 A little rustic holiday spirit in the form of an advent calendar, it’s cute and charming and great for some holiday decor. I’m willing to bet you could use one of these, because I lose my phone all over my house and constantly forget to charge it. This is one of things where I always think: “why didn’t I think of that?” It’s so simple and perfect. 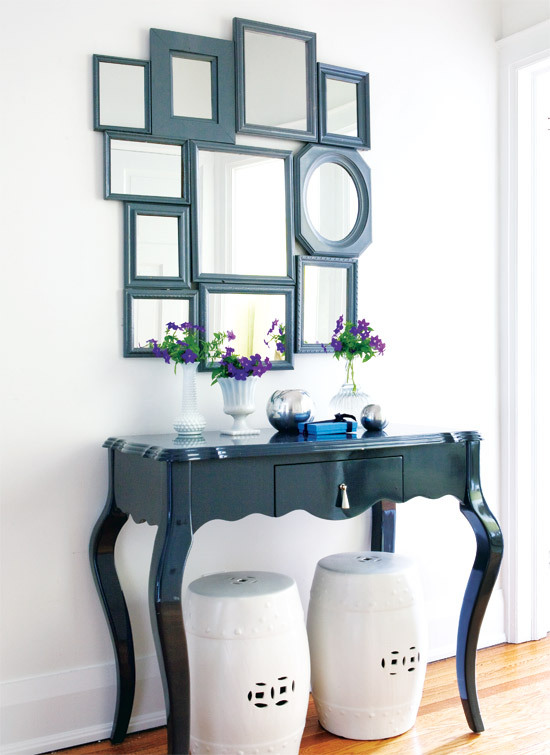 Just finding a few simple items and combining them can turn it into a beautiful display. 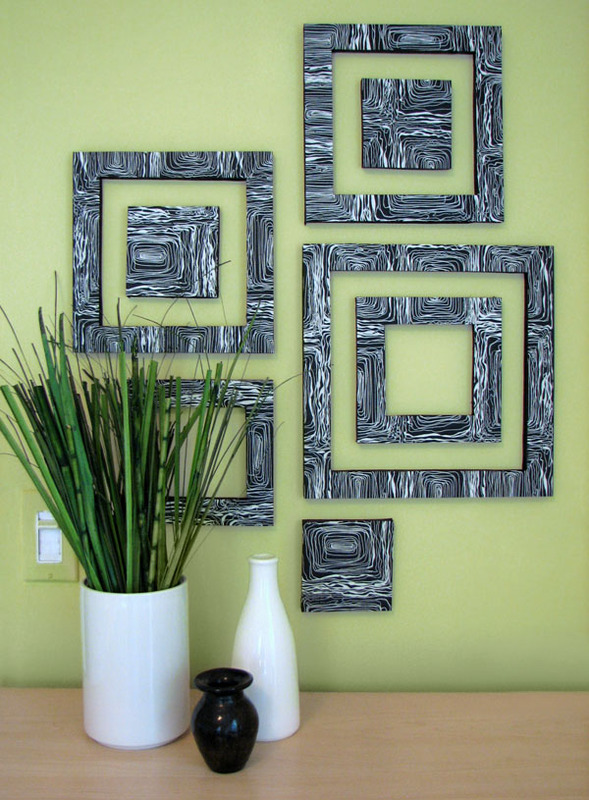 Find your inner artist and go a little abstract with some painting and framing to create an interesting display. 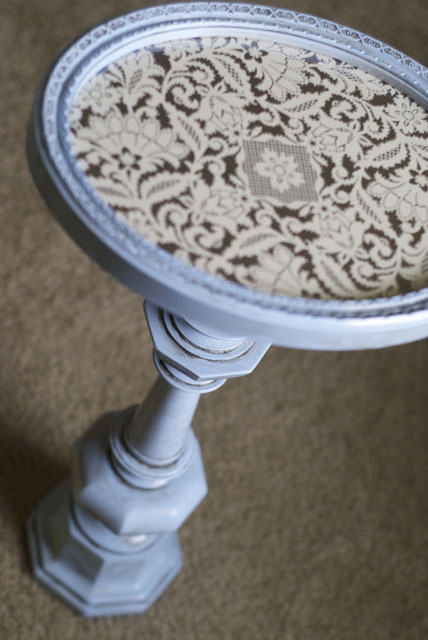 At first glance this might look like a difficult task, but if you take a closer loo the pedestal is actually an old lap and frame, painted blue. 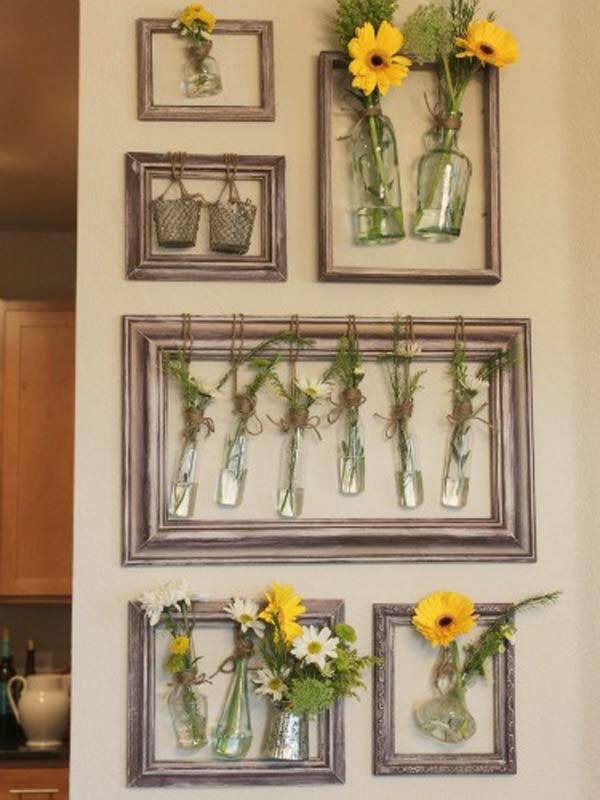 Another collection of framed jars and plants, starting to notice a trend? Probably because it’s just such a neat idea. 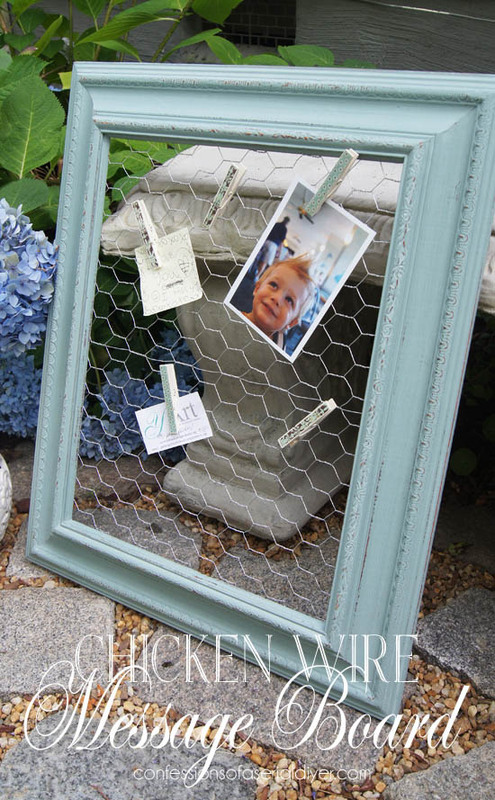 I never would have thought to combine chicken wire, clothes line clips, and a vintage frame, but it works. 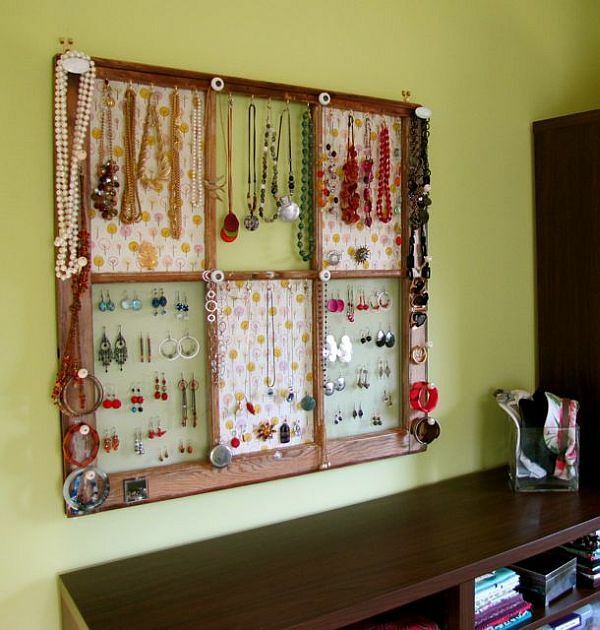 Just like the jewelry display, but especially useful for someone who desperately needs a way to keep their glasses in order. 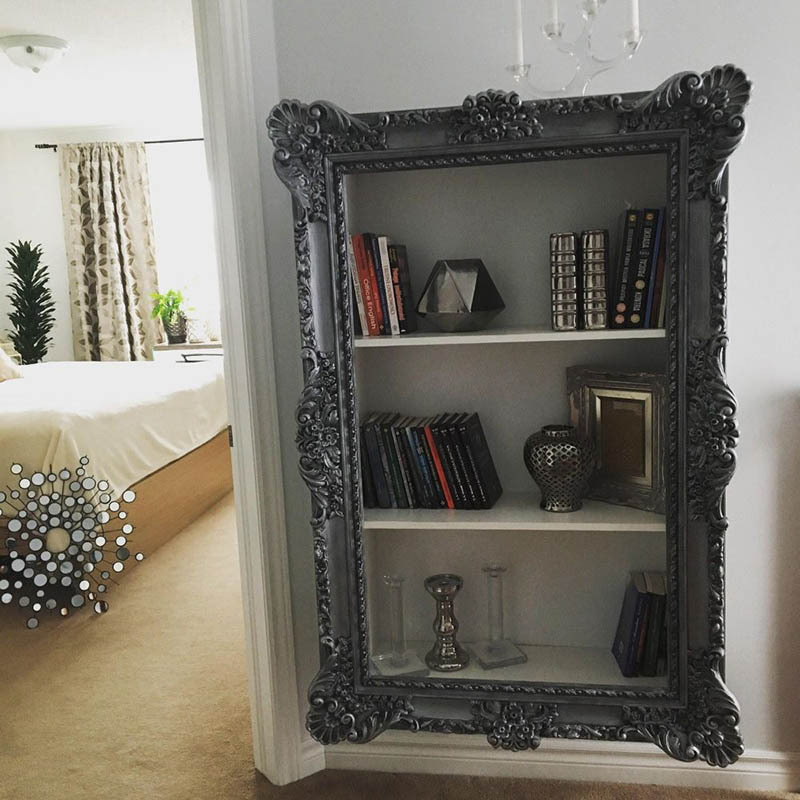 Find a collection of mirrors and old frames, and now you have totally unique and budget friendly wall decor. 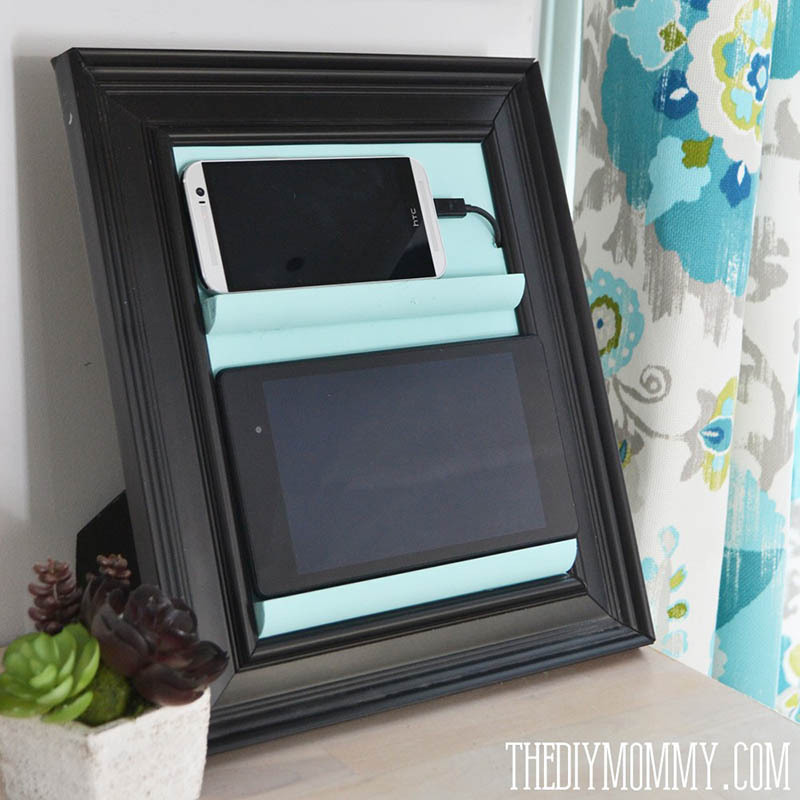 Amazing if you have kids, and great for keeping all your most important school tasks and chores in order. 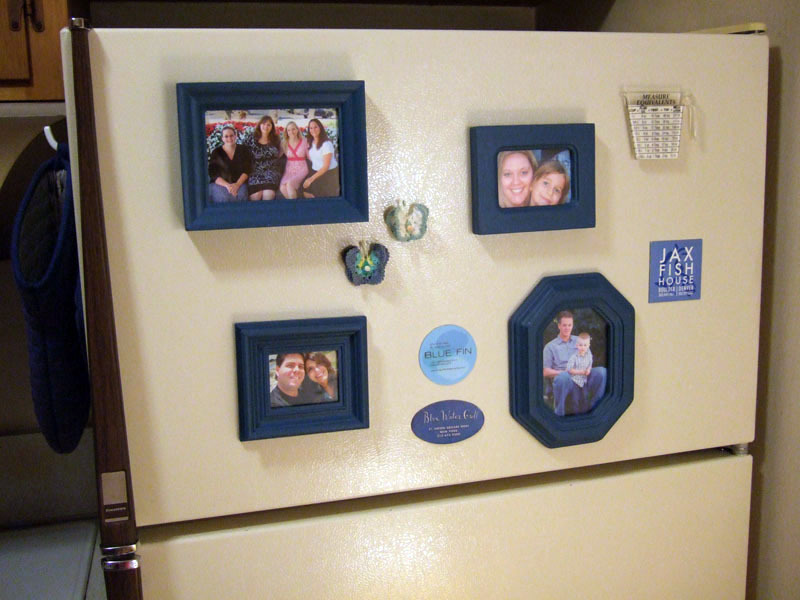 Magnets are cool and all, but how much cooler do these look with mini frames? 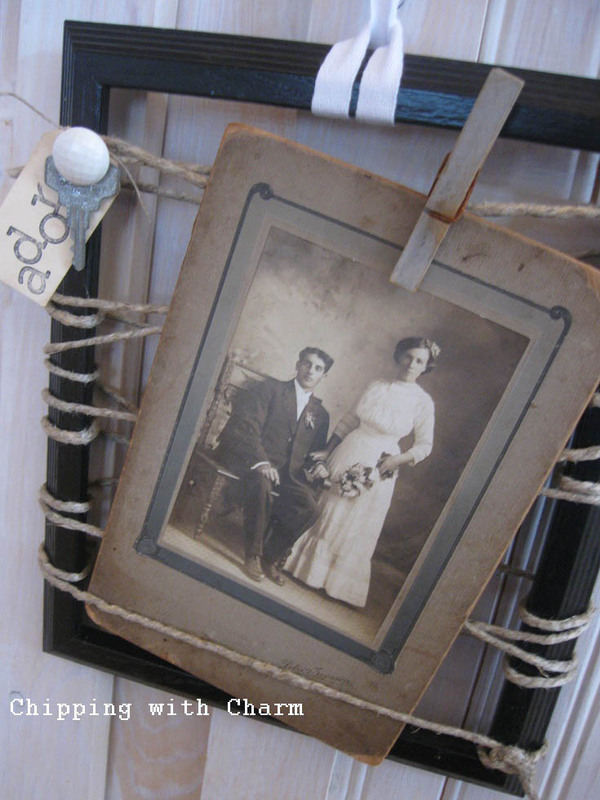 If you’re going for the farmhouse rustic charm (and who isn’t these days? ), then I’m sure this caught your attention. 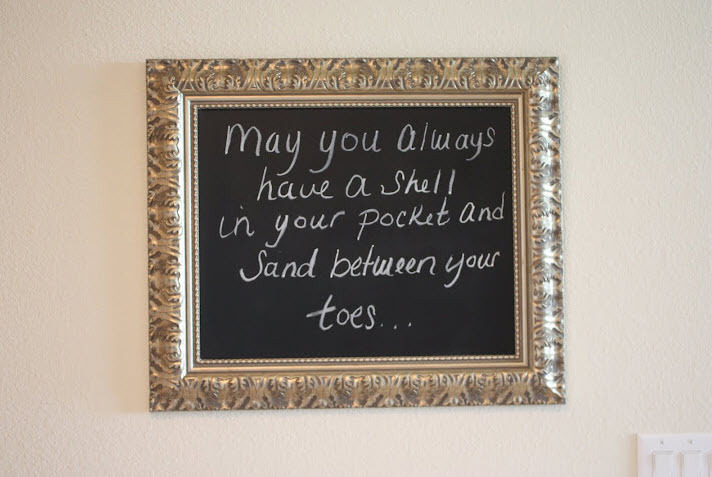 And I’m sure it’ll catch the attention of all your guests as well. Big and bold statements coming from this shelf. 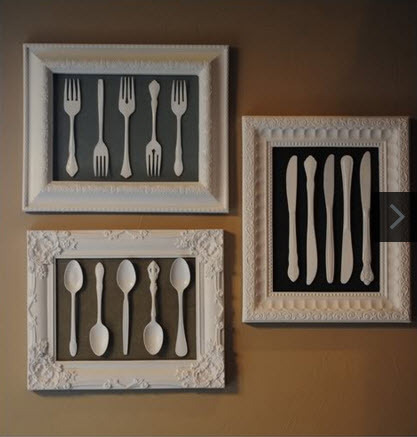 Vintage frame designs with painted silverware is another unique (and budget friendly) approach to some shabby wall decor. 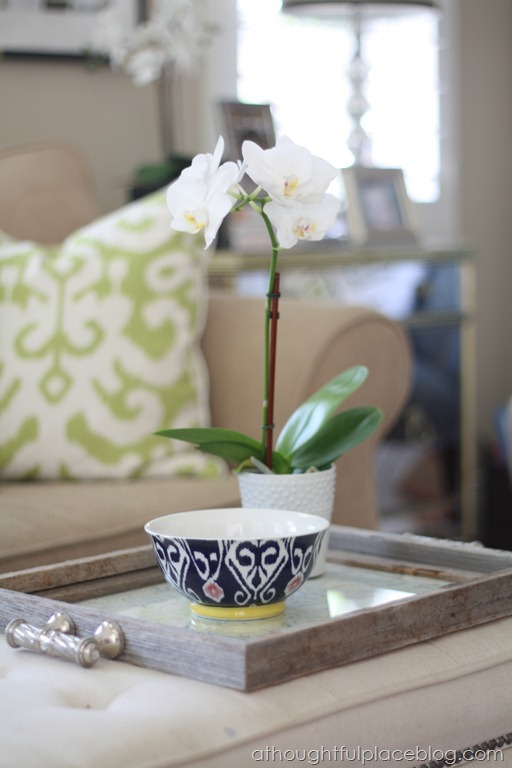 A really good Pottery Barn knock-off you can make at home and it won’t cost you a fortune! 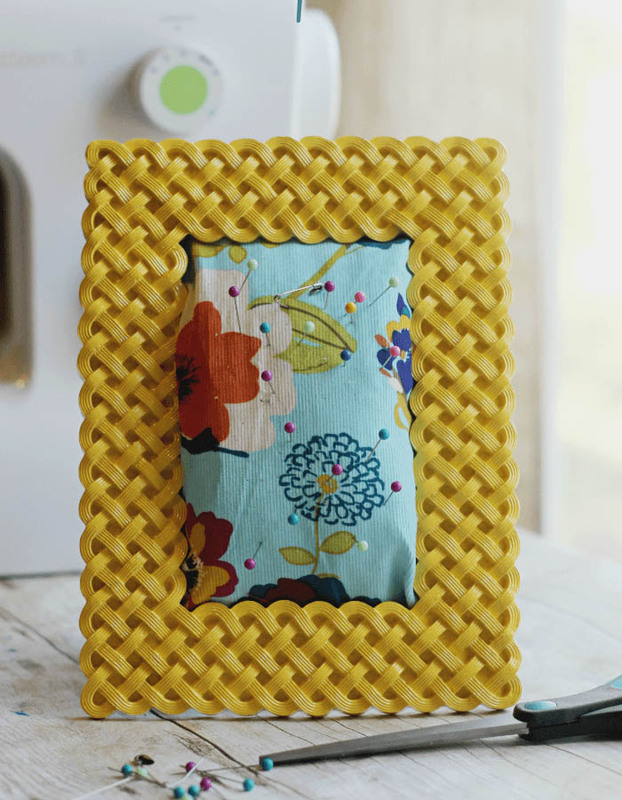 Introducing the the new-old picture frame 2.0, now with even more vintage charm. Yep, this is a working lantern styles light fixture made from old frames. 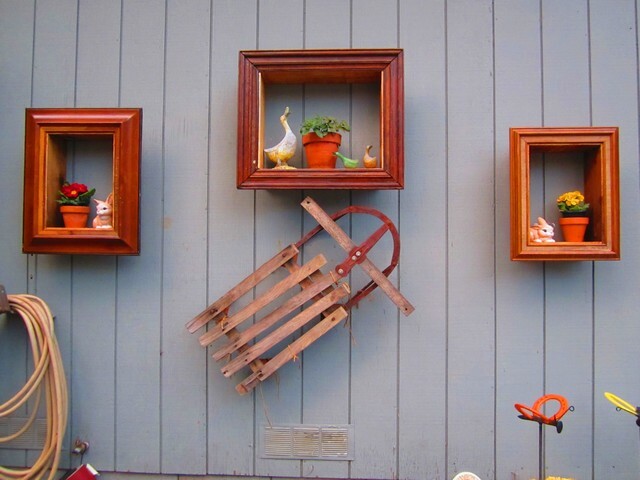 You’ll need 4 identical frames and little bit of painting skill, but it absolutely works. 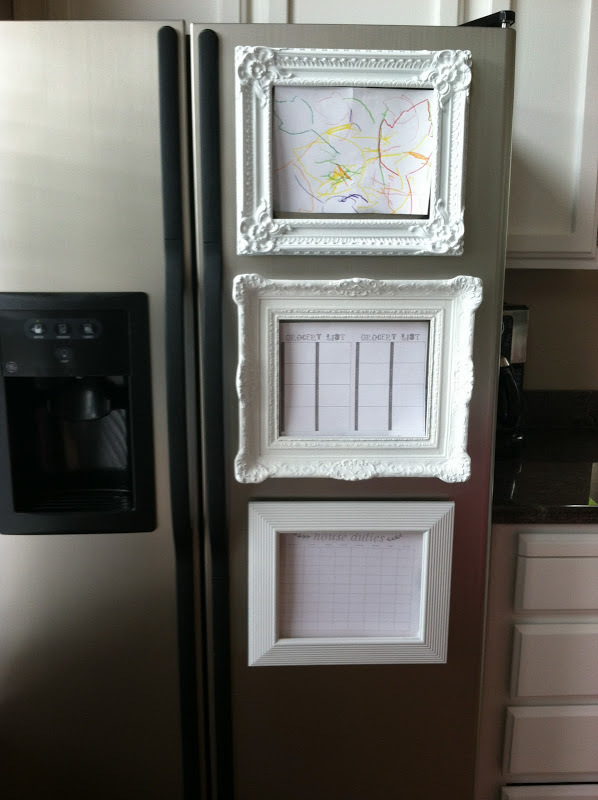 Frame your kids drawings, the weekly calendar, and weekly events. Who says the front of the fridge can’t look shabby and organized? 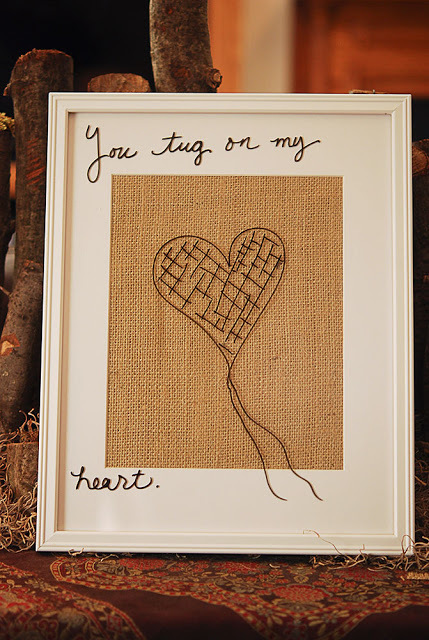 Create this beautiful work of art with a collection of notes, pictures, ribbons, and small keepsakes. 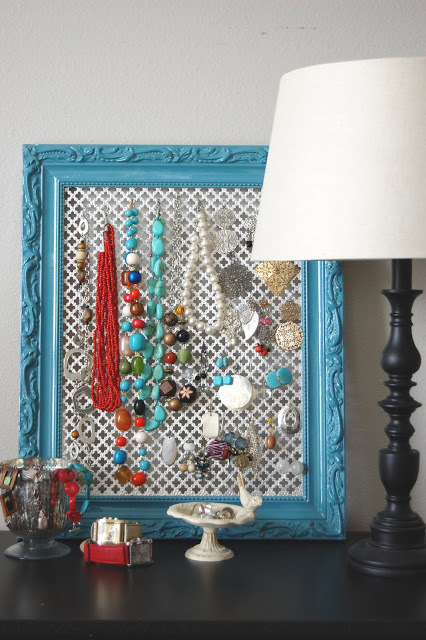 It’s an artful pin board that will certainly gain attention. 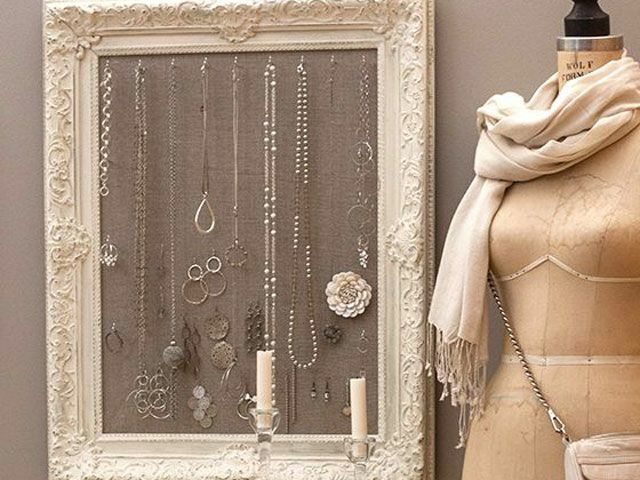 Another jewelry hanger, but it’s always neat to see how different people approach the same idea (so that you can create your own ideas). 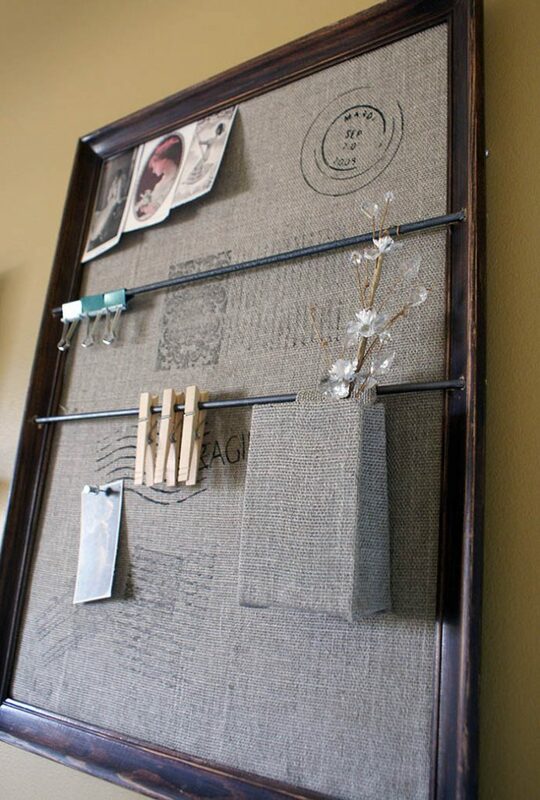 And another pin board but with a different approach. 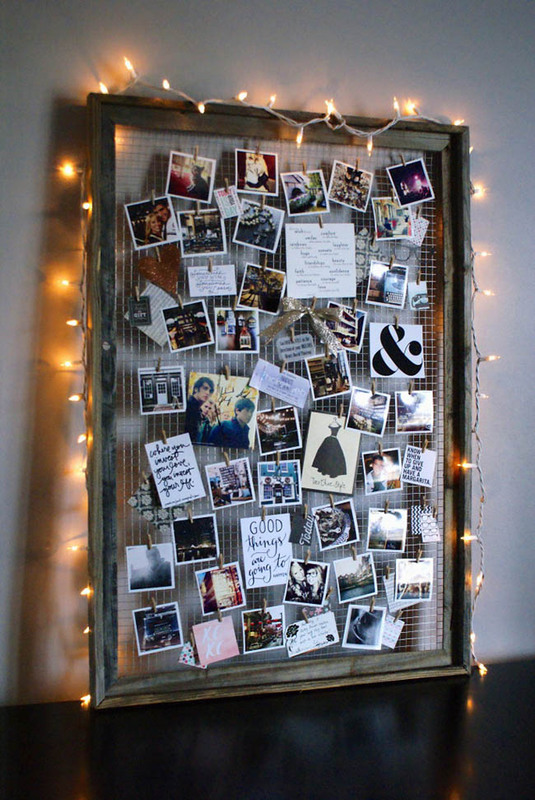 But your pin board can be used as a collection of ideas, personal goals, or just pieces of things you love. 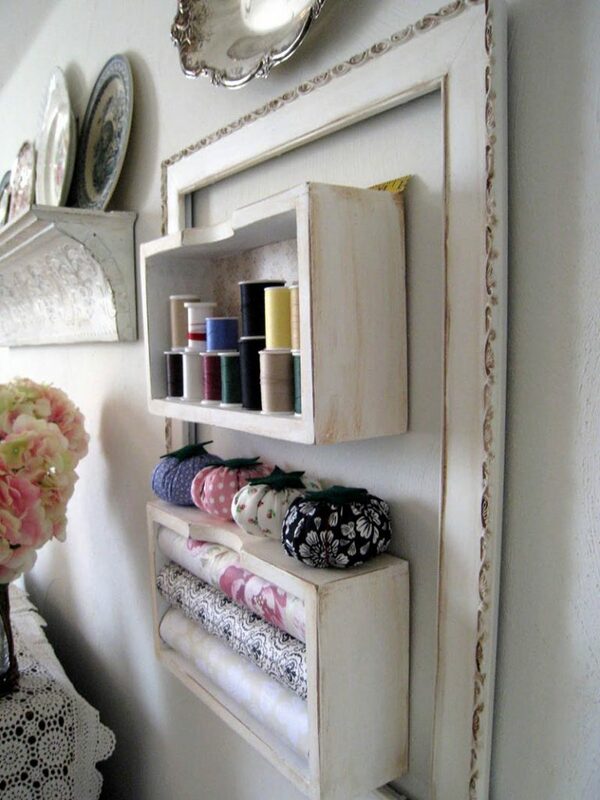 Use old frames to organize your sewing room. What? 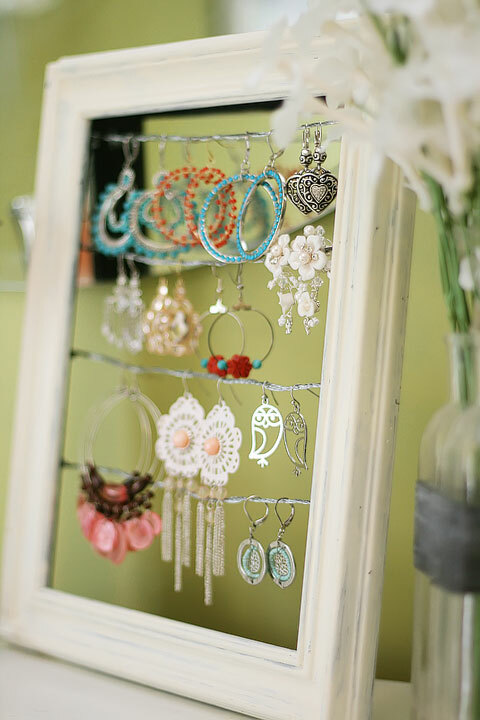 Another Jewelry Holder? But see how awesome that grid is? Well, that’s actually a clover leaf radiator grill from Home Depot, and look how perfect it goes with that painted frame. 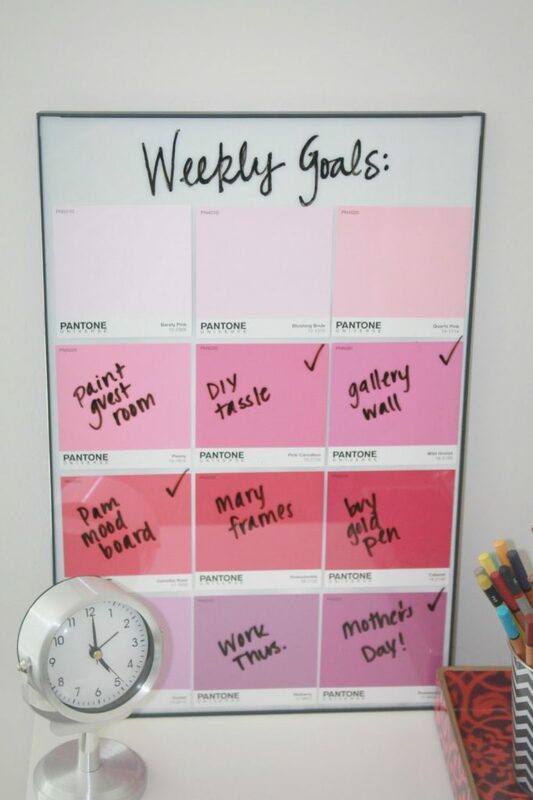 Create a white board from paint sample cards and then frame it to win in life. 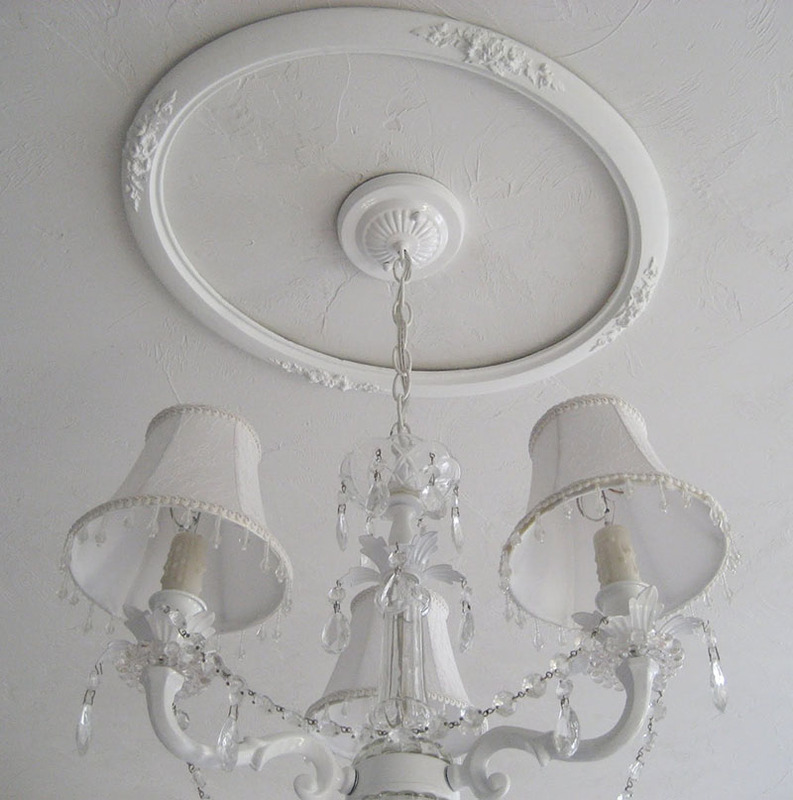 That’s right, framing your chandelier adds a whole new level of charm you didn’t know you needed. 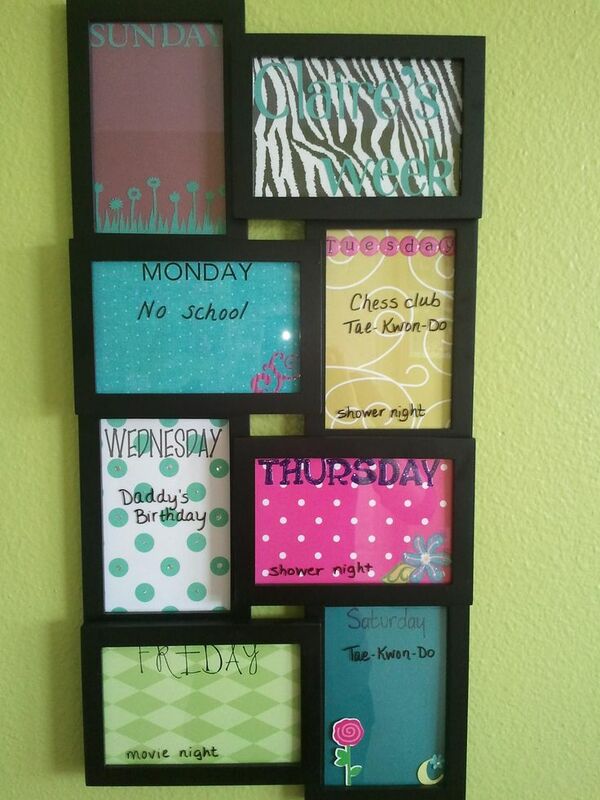 Who want’s boring old file folders when you can frame them for maximum awesomeness. Hide garage door openers, intercoms, light switches, and more! Maybe you need something a little simpler but handy? 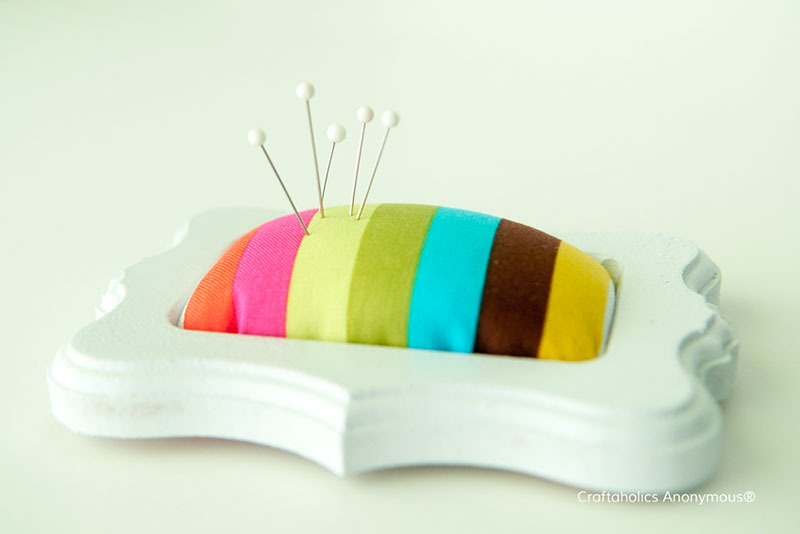 How about this cute pin cushion. 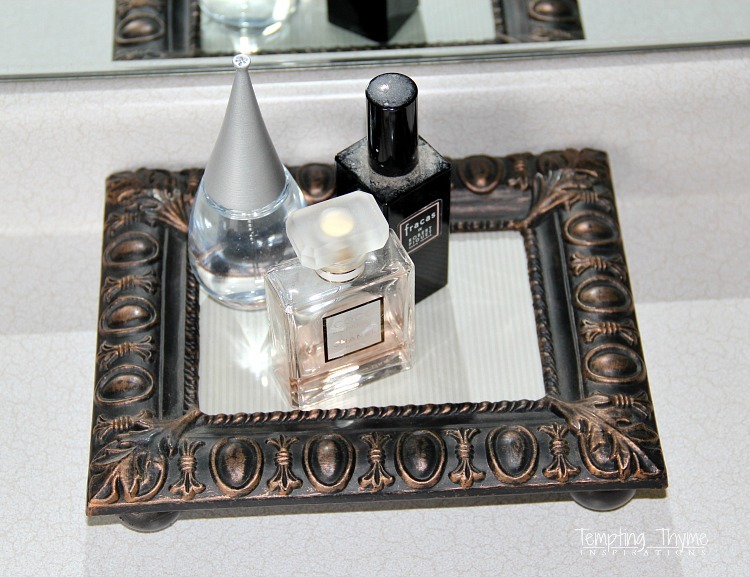 A beautiful vanity tray to display your perfumes or colognes. 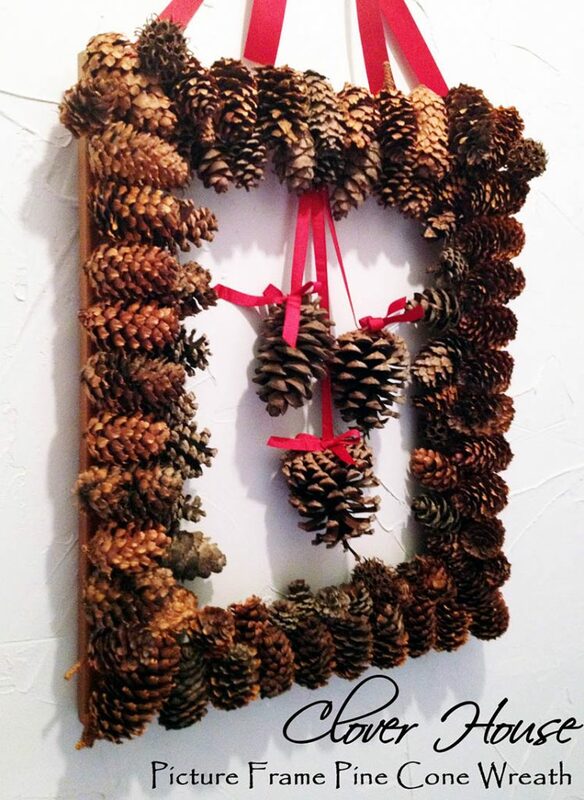 You probably have a few pin cones in your area, and you can glue them around a frame to get in the holiday spirit without spending much. 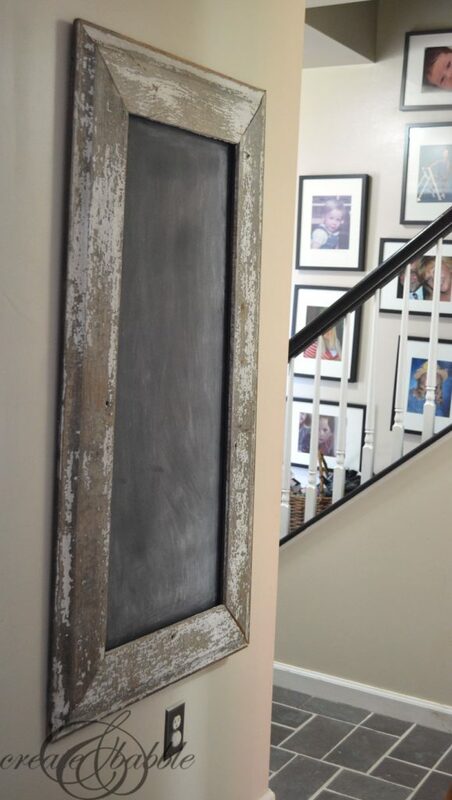 Simple yet effective, just a rustic chalk board for your everyday needs. 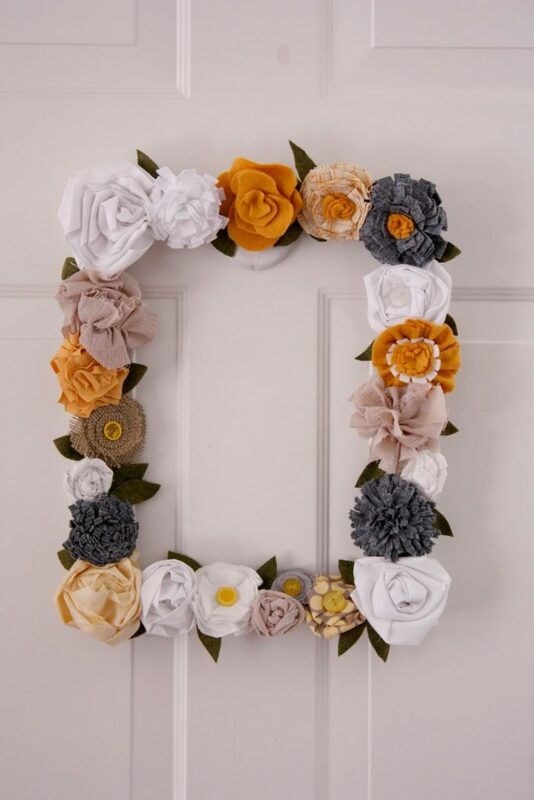 Hit up your local craft store and hot glue these flowers to any old frame you have laying around, in no time you have a beautiful creation. 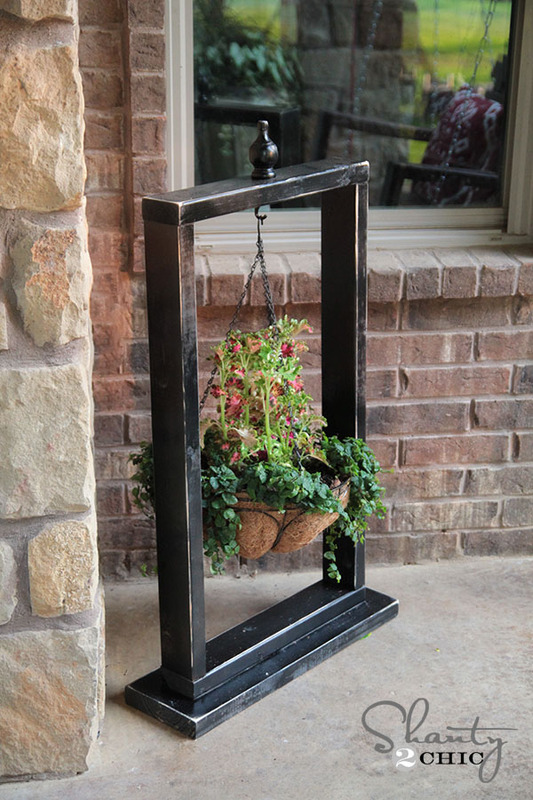 Here’s a more practical use of a frame, turn it into a table and tie it up for a plant holder. 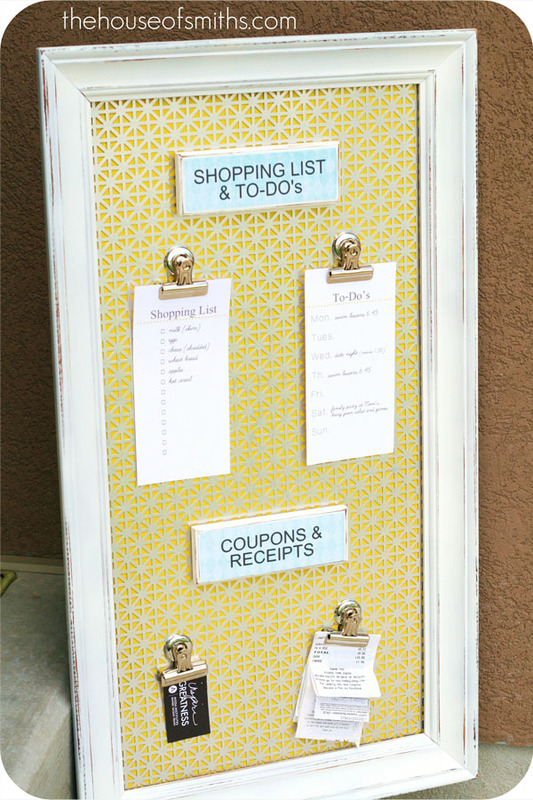 Create your own magnetic board that suits your style and keeps your organized. 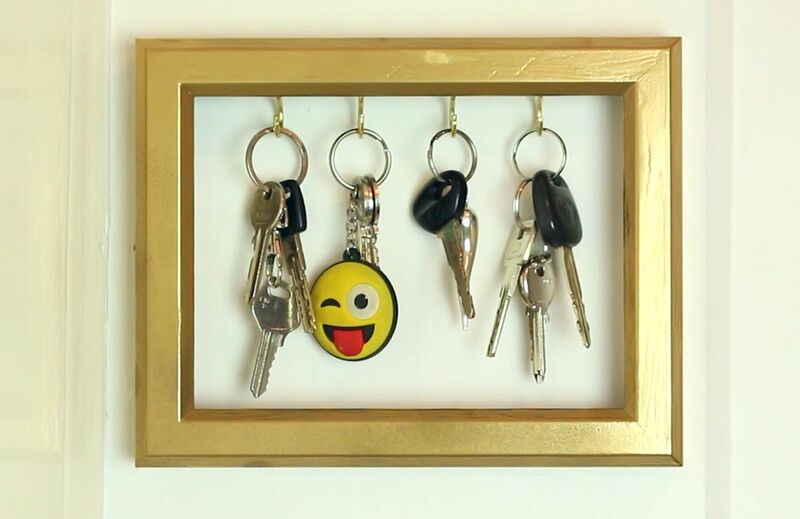 Simple and effective, hang your keys up in style. 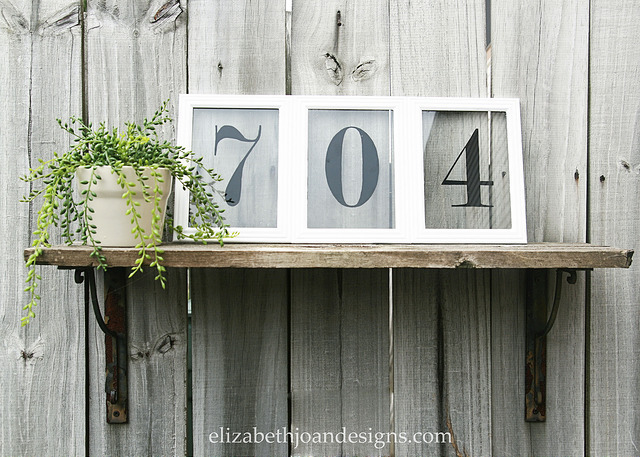 Who needs boring old house numbers, do something different that stands out of the crowd. 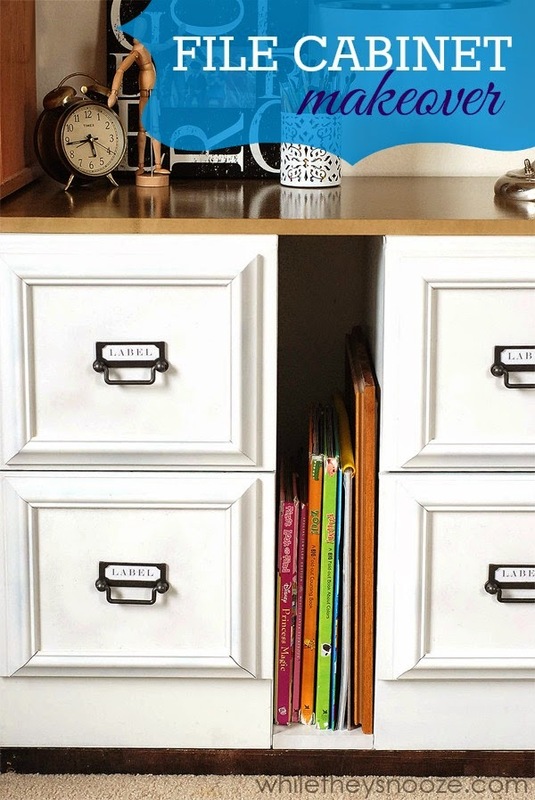 Who doesn’t love secret compartments? 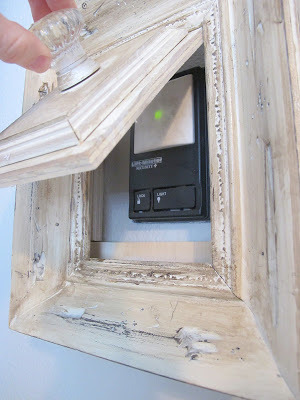 Hide your medicine cabinet, safe, or other hidden treasure behind a picture frame. How cute is this? 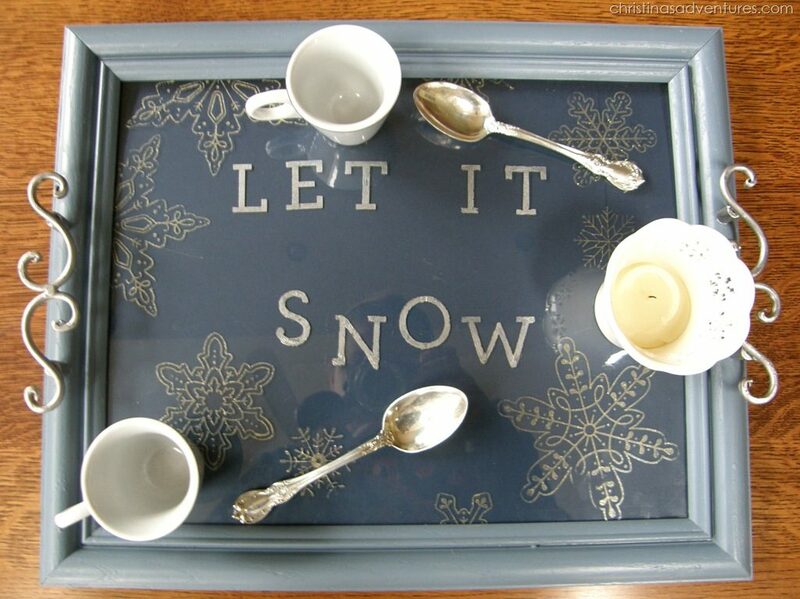 Break out the eggnog and pull out this tray for some serious holiday spirit. 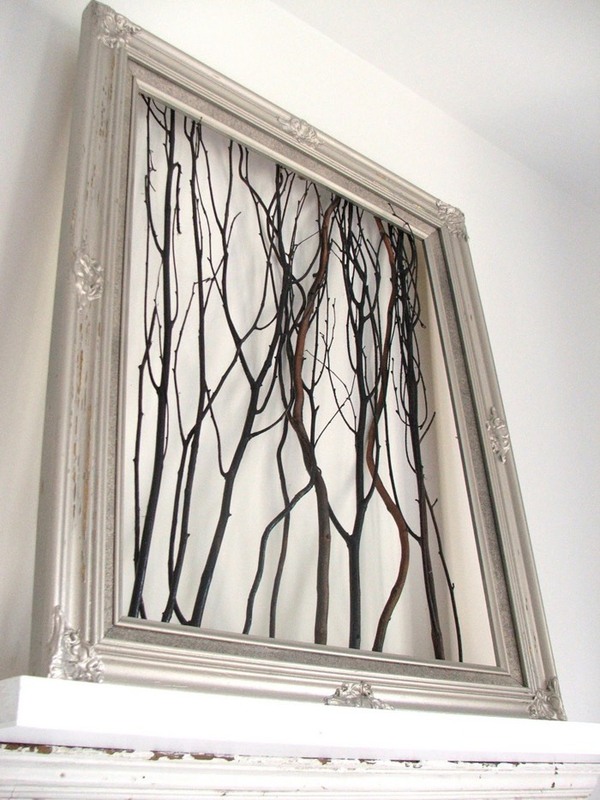 A vintage frame and some sticks creates modern art that looks like you stole it from a prestigious museum, not bad. 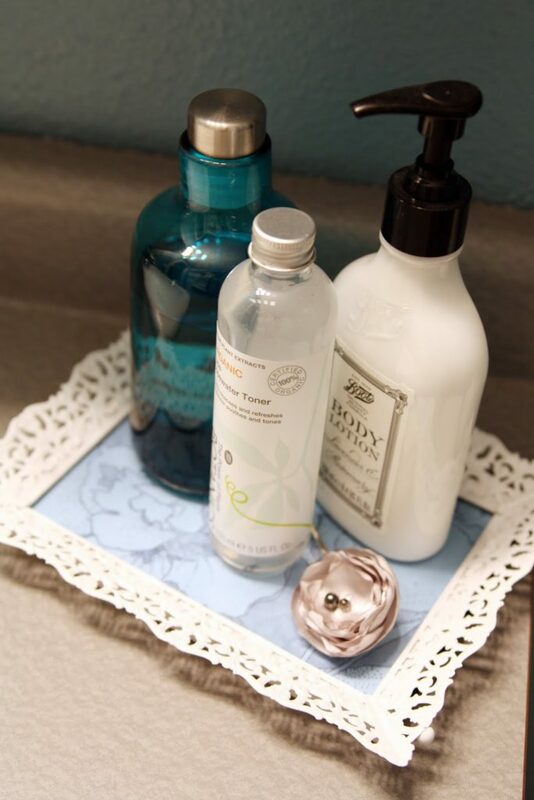 A cute and beautiful vanity tray for the bathroom, keep your soaps or perfumes on display. 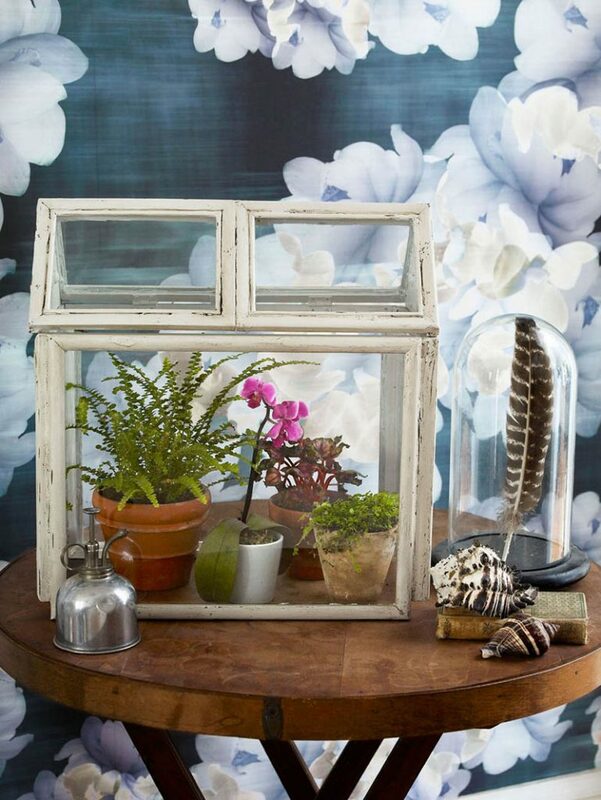 An adorable display that would look great indoors or outside in the garden. 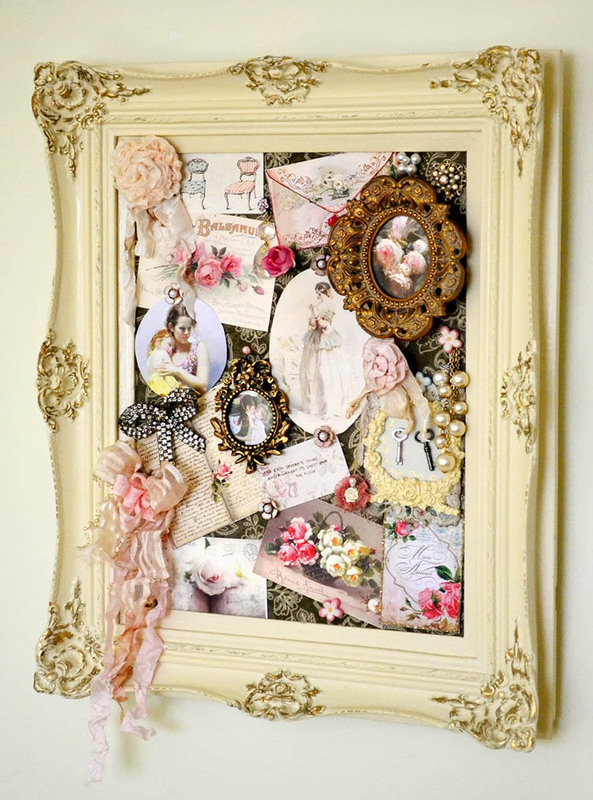 A pin board with some beautiful aesthetic that begs to be used. Hey it’s another pin cushion idea, but I’m okay with having more than one. 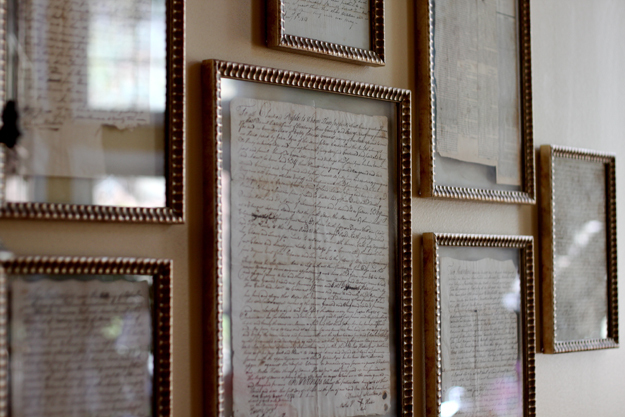 A collection of your best memories, hopes, and dreams put on display in the most beautiful way possible.